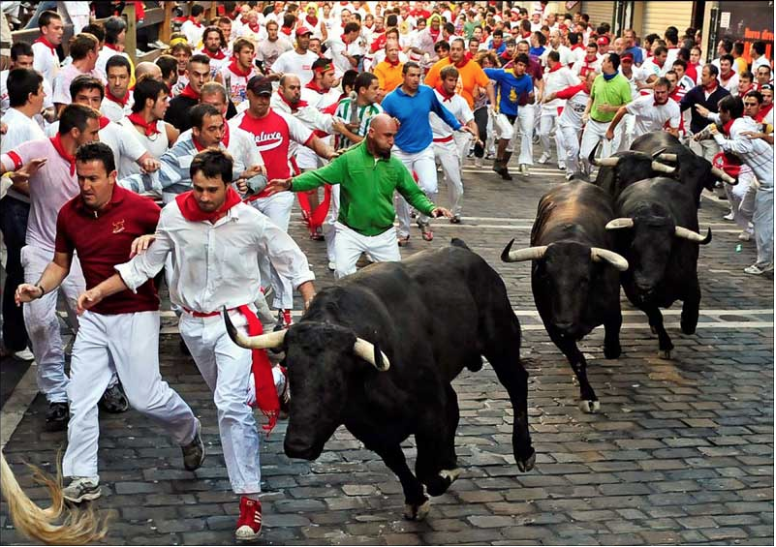 Pillar to Post: WORLD TRAVEL / SO YOU WANT TO RUN WITH THE BULLS? 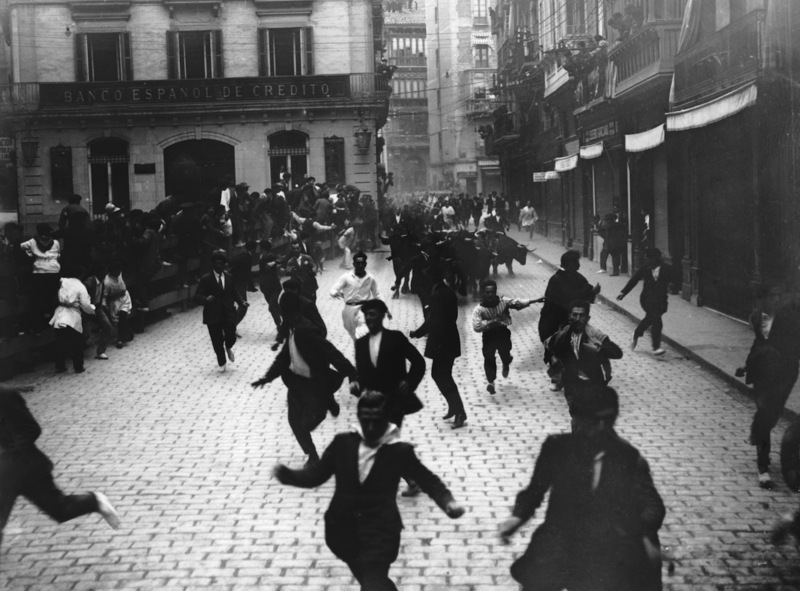 Each year at the beginning of July (since before Ernest Hemingway was still single) the Festival of San Fermin occupies the northern Spain city of Pamplona. 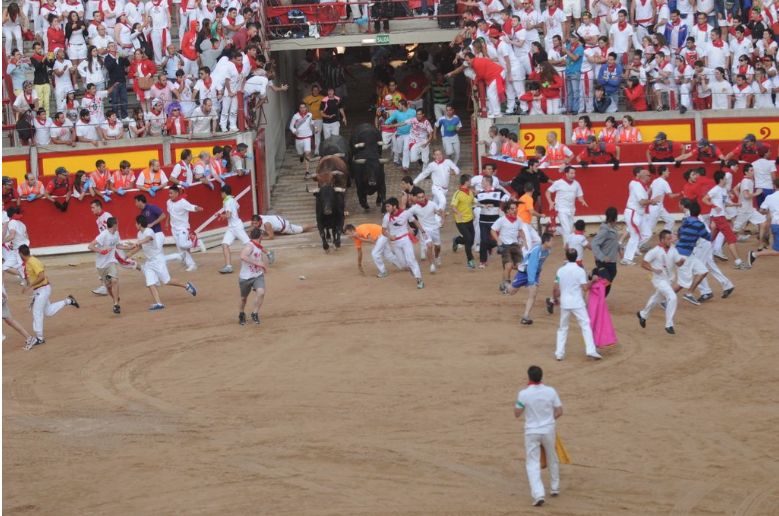 Highlight of the weeklong fete is the running of the bulls through the cobblestone streets of Old Pamplona on July 7th. Check the map to note the running of the bulls route goes from top to bottom for half a mile (875 meters) along several narrow streets in the old part of Pamplona. 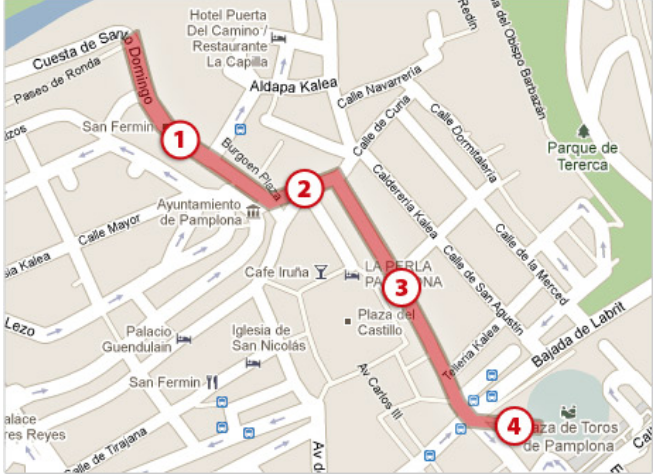 The race starts from (1) hilly Santo Domingo Street; then left (2) on Calle de Mercaderes. Where Mercaderes meets Calle de Estafeta is known as deadman’s curve. Bulls make a sharp right turn (3) off of Mercaderes onto Estafeta. The bulls often lose footing at the corner and slide to the left as they make the bend. At the end of Estafeta is the area around the race’s destination: the bullring (4). For a brief history of the race click here. For a video of deadman’s curve click here. For a print version of the race route click here. Violent video of angry bulls in 1966. click here. Deadman's curve. 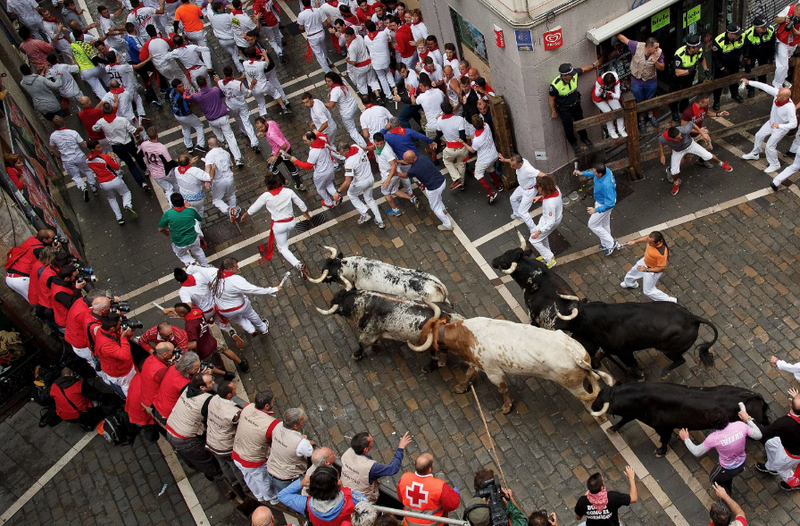 Bulls are making a sharp right turn off of Calle de Mercaderes onto Calle Estafeta. Young ladies interested in a bit of extra noontime attention might hop on the shoulders of the nearest Spaniard. You’ll get a good view over the crowd, but as soon as you lift your top to show off your assets be prepared for sangria splashes and a groping session to last a lifetime.